5 − = four Required Please enter the correct value. It's hard to imagine a situation where this most recent 86 billion euro ($94.1 billion) Greek bailout will succeed where the first 110 billion euro ($120.4 billion) Greek bailout in 2010 failed. Or where the second 130 billion euro ($142.2 billion) Greek bailout in 2012 also failed. We've all seen the havoc this debt crisis has wrought on the Greek economy. Five years and 240 billion euros in loans ($262.6 billion) later, Greece's unemployment rate is hovering near 26%. Greece's labor force has shrunk by 975,300 workers, or 22%. Now the Greek economic crisis is only matched in the devastation it has brought to Greek society by the damage of a Greek political crisis – one that's not as well-known and is, at the same time, widely misunderstood. "The political system is dead," Katerina Moutsatsou, a Greek activist and filmmaker with the Underground Network, told Money Morning. The first indication Greek politics were crumbling came with the rise of Syriza in summer 2012. Greek elections at that time helped preserve the bailout and austerity regime both governing and impoverishing Greece, as the New Democracy party retained parliamentary power. But it also helped raise the profile of the radical left-wing Syriza. This was the anti-bailout, anti-austerity, Euro-skeptic party that struck a chord with an increasingly populist Greek electorate growing tired of bailouts authored by foreign European financial institutions. These are the very bailouts that entailed labor-crushing austerity measures over the following years. The 2012 Greek elections didn't just set Syriza's future in motion. 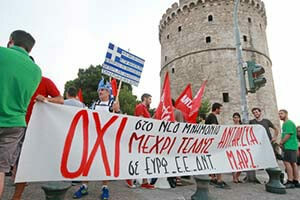 It severely weakened the Panhellenic Socialist Movement (PASOK), one piece of the two-party fiefdom governing Greece since the end of the 1974 military junta, largely controlled by two families – the Karamanlides and the Papandreous. New Democracy was the other piece tossed aside when the 2015 Greek elections brought Syriza to power. But for billing itself as a "radical left-wing" government looking to challenge the Greek establishment and stand up for the Greek people, little has changed. New Democracy lost its grip on power near the end of 2015 when then-prime minister Antonis Samaras failed to fulfill promises of weaning Greece off of foreign bailout money. It became clear that further New Democracy leadership would mean further austerity. Syriza, touting an end to austerity, was the best alternative. But with the most recent Greek bailout and the Syriza capitulation, Moutsatsou pointed out a troubling reality in Greek politics. "Everything Syriza did was totally predictable," Moutsatsou said. There was a time early on, prior to the 2012 elections, that Syriza was a reflection of the Greek populace. They were willing to do anything to end austerity, even if that meant exiting the euro – a "Grexit." But these are "easy things to say when you're not in government," Moutsatsou said. The 2012 election empowered Syriza and brought them into the fold of Greek politics. "Once they became the main opposition party, everything changed," Moutsatsou added. This was evidenced first by Syriza's choice of finance minister, Yanis Varoufakis. He was initially opposed to Greece's entry into the Eurozone in 2001, but also revealed that he felt a Grexit would be a disaster. He aired these concerns as a private citizen in 2013, when he did a tour for his book, "The Global Minotaur: America, the True Origins of Financial Crisis and the Future of the World Economy." "When you don't have a currency, you can't devalue it. All you can do is, you can announce, 'In eight months, we're going to have a currency and, by the way, we're going to devalue it,'" Varoufakis said in a discussion. "Can you imagine a preemptive announcement of devaluation eight months before it happens? This is a recipe for having all wealth liquidated and leave the country." And when Prime Minister Alexis Tsipras began the Greek debt talks, he misframed the mandate on which he was elected. He abandoned any vestiges of rhetoric suggesting an end to austerity at all costs and adopted rhetoric of ending austerity but staying in the euro. Never mind that such a feat is impossible.